The Northwatch Interrogator can be found in the torture room of Northwatch Keep. 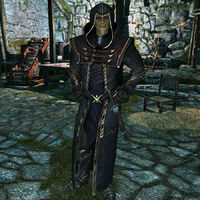 He wears standard Thalmor Justiciar equipment and carries the Northwatch Keep Key, which opens the back door to the keep. His methods are brutal, considering the desiccated remains of a person on one of the tables in the room, and the amount of ancient embalming tools found. This page was last modified on 12 November 2013, at 00:51.